Opening night will be marvelous! The exhibition something else! 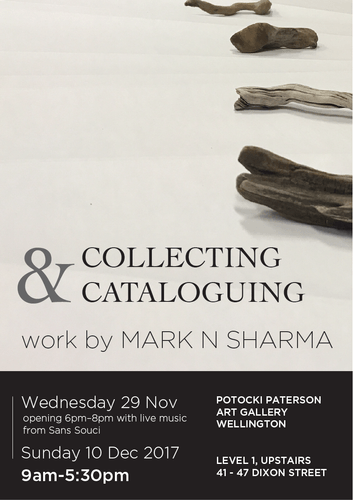 Come along on Wednesday 29th at 6pm to celebrate Mark Sharma's first Wellington exhibition in over 20 years. Refreshments provided with live music by none other than Sans Souchi. Mark is of Indo-Fijian, Southern Māori, Polish, Irish and Scottish ancestry and has been exhibiting his work in group and solo exhibitions for 20 years with his first solo exhibition in 1997. He also designs exhibitions for museums and galleries. Sharma’s work is not representational of a specific place, although he is influenced by his home environment of the Otago Peninsula, often with land and seascape forms appearing. His recent works continue to use a growing palette of symbols, lotus flower, waka/huia and geometric patterns reflecting Mark’s heritage and personal aesthetic. The image/symbol of the lotus flower has long been used in Egyptian, Buddhist and Hindu cultures and is associated with the human soul of an individual, gods and goddesses. The meaning of the lotus flower includes purity and enlightenment, wealth and rebirth. The Egyptians used the lotus to symbolize the sun and rebirth in creation mythology. The recent work exploring geometric patterns takes inspiration from traditional Fijian Masi art and recent controversy over the trademarking of traditional patterns by Fiji Airways. The pattern of lines also reminiscent of the late Ralph Hotere’s work Black Union Jack. "In many ways this exhibition is itself an example of collecting. I have included some works from my personal collection that I continue to refer to and provide context for further explorations. This being my first Wellington exhibition it feels fitting in the place of our National Museum Te Papa to be referencing ideas of collecting and protection of taonga."